Some stones are indeed special. They might look like any other stones, but they mark special places and represent special events. In upstate New York, for instance, I was aware of several native American cairns. In my Central European homeland I visited Celtic and some older Megalithic monuments and of course everyone knows Stonehenge and perhaps menhirs of Brittany, Cornwall or Ireland. Biblical tradition also mentions special stones infused with deep meaning and significance. Some stones are truly crucial to what is called “salvation history” - core stories of our faith tradition. This Sunday one such stone will open our mind for the deeper understanding of sanctuary as a place of rest, place of protection and divine assurance. Come this Sunday to rejoice in the divine message conveyed by one special biblical lithic pillow. Navigation Heiau (Maka o Hule) on Kohala coast of Hawai'i. In this church I preached my first sermon. The history of this picturesque church in Prague goes all the way back to 1178. As you can see even from this small picture, it is a unique and bizarre structure, over centuries it was rebuilt many times and in many different styles - Romanesque, Gothic, Renaissance and Baroque. Throughout its long history it was a parish church, a seat of radical Reformation, it was deconsecrated and turned into a warehouse and apartment building with some stores, before it was reconstructed and made into a Protestant church for university students. 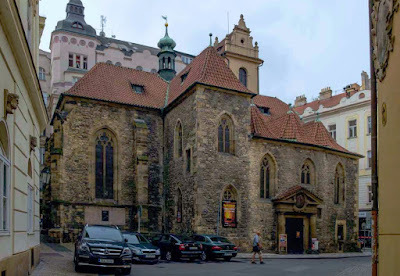 But for most of its history this church was part of the Prague city wall - hence its name St. Martin in the Wall. The south wall of the church was integrated into the fortification of the Old Town of Prague. Although the church wall was hardly thicker than the rest of the city wall, it was, nevertheless, its safest part. Noone would ever dare to attack the city through the church or even enter the church armed and in hostility! This historic little church is in fact an embodiment of the very old and revered concept of sanctuary. In Lent this year we will talk, learn and celebrate sanctuaries - these important sacred spaces. Why we need them, how we can use them and why we must protect them. - Who hath put wisdom in the inward parts? or who hath given understanding to the heart? - Who has put wisdom in the clouds, or given understanding to the mists? - And who has given to women skill in weaving, or knowledge of embroidery? - Who put wisdom in remote places, or who gave understanding to a rooster? - Who has given the ibis wisdom or the rooster understanding? Can you imagine more diverse translations? One Hebrew word (טחות) is rendered as: the inward parts, the clouds, skill of weaving, remote places or the ibis! While another Hebrew word (שּׂכוי) is translated as either the heart, the mist, embroidery, or a rooster. So what is the right translation? No one knows! And enough said about the biblical inerrancy of the fundamentalists! 2) Why should the bible declare that chickens are endowed with special understanding or knowledge? Ask any farmer around the world - chickens are proverbially stupid. There are stories about chickens running around the yard and even surviving for weeks after their heads had been chopped out. Clearly, chickens’ need for a brain is not particularly great! 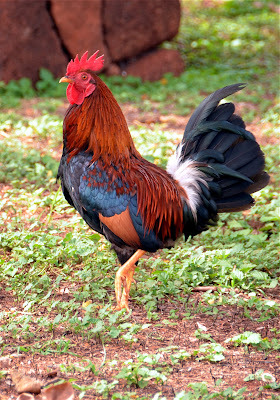 Chickens are perceived as uniquely unintelligent birds, unless you consider their ability to welcome dawn and announce rain. But that is another puzzle. 3) Roosters are known to predict dawn with annoying accuracy. But how do they do it? Some biologists think that it is because of their inner circadian clock. I have a different theory. I developed it when I started to take long exposure night pictures. I realized that dawn arrives hours before actual sunrise. Long before my eyes can notice absolutely anything my cameras start picking up the first photons scattered in the atmosphere above the eastern horizon. Then, when it is still almost invisible, roosters begin crowing. Similarly, rain must also be preceded with some subtle changes in luminosity. Roosters, after all, might have this special skill of very sensitive eyes. This Sunday we will engage further ornithological mysteries, metaphors and legends while we fold origami cranes and send them to deliver our prayers for nuclear disarmament, peace and understanding among nations and peoples.